Photography has gone totally digital in recent years. It has also become easier to create interesting images and visuals as a result. There are many sophisticated software available for editing photographs and creating various artifacts out of them. Some of them are expensive while they are also complex and take some amount of learning. While you must do so for professional purposes, sometimes you just need something plain and simple for personal work. If you are just editing your family album and want to post on your Facebook Wall or blog, you will probably look for something simple and hassle free. FotoJet has been designed keeping exactly such needs in mind. It is a simple application where you can just upload your images and create collages using pre-existing templates. It is also a free service and very easy to use. So, let us take a deeper look at the service and explore its pros and cons. The first thing you need to know about FotoJet is that it is a web-based service. So the good thing is that you don’t need to download and install anything. Especially the not so tech-savvy populace gets intimidated if they have to install software. That part is eliminated with FotoJet being an online resource. You can also store your collages and photos online here, freeing up space on your hard disk. On the flip side, you must have a functioning internet connection all the time to use it. So, it can be an issue when you are traveling or don’t have internet access. Using the site is rather easy with a simple interface. It is generally intuitive and you will figure out as you go through it. But if you still need detailed instructions, they have also put together a good video tutorial that you will find at the bottom of the homepage. Anyways the process is as simple as uploading your images, choosing the preferred template, and creating the collage with a few clicks. As far as the templates are concerned, FotoJet has put up some good work behind them and created templates of different designs, colors, shapes and sizes. One interesting thing is to note is that while most such software only focus on design, FotoJet has kept the shape and size in mind too because it has realized that different purposes demand different sizes. For instance, your visiting card will not have the same dimensions as your Facebook cover image. So, FotoJet has kept this in mind and offered options for different purposes such as photo cards, Facebook cover image, birthday greetings etc. The designs have been categorized according to themes, so you can have artsy ones, minimalist ones, or even 3D designs if you are looking for something too flamboyant. We felt that it can expand its repository of designs by including some sleek, cutting edge designs that will be more attractive for business users. Of course such users generally go for more complex and high end options but new entrepreneurs who are low on budget may appreciate the same. As of now the designs are most suitable for personal purposes. Be it birthday cards or Mother’s day greetings, you should be able to find something suitable and add a personalized message to complete it. As discussed earlier, FotoJet interface is pretty easy to use. There is a drag and drop interface which is pretty sleek. All you have to do is to drag the photos from your folder and drop it on the site and the upload starts automatically. Conversely, you can also extract the images from your Facebook albums. Once you select the template, it is all about choosing the images you want to include here. You can flip or rotate the images as much as you want. So, in terms of ease and customizability we have to give full marks to this system. Once complete, you can save the image and use it the way you want. You can get a printout or get it mailed but FotoJet gets extra marks as it also allows you to post it directly to Facebook. In the future we hope it will also include other social networks in the scheme of things. FotoJet is a timely and useful service. Not everybody needs complex, cutting edge utility for image editing especially for personal usage. This simple service takes care of such basic needs efficiently. There are other such services but they either are paid or are not up to the mark. While FotoJet can improve its array of designs to provide more options, so far it has done well enough and deserves a look in. 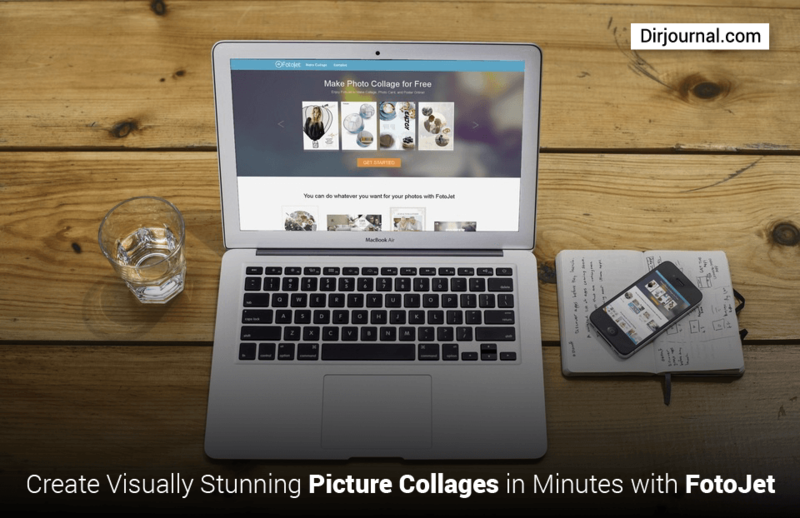 • Supports freely editing templates and creating collage from scratch. • Adds 100+ additional templates, now 500+ in total. • Supports adding text and clipart, providing 10+ preset text samples and 500+ clipart images. • Offers more editing features including Undo/Redo, and Snap. • Comes with an all-new GUI. • Provides with dozens of other improvements. You can click it to know more: http://www.fotojet.com/.